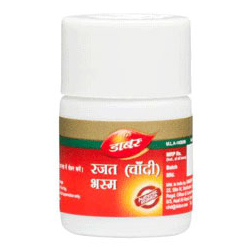 Dabur Mukta(Moti)Bhasma Relieves Mental Fatigue & Optimises Concentration & Memory, Improves Appetite, Eye-sight, Strengthens Heart. Dabur - Ayurvedic Bhasma - Worldwide Shipping. Relief in burning sensation in the urinary tract, burning sensation over hands and legs, sleeplessness, irritability. As Rasayan, it improves appetite, eye sight , complexion and strengthens heart and brain. It is also effective in teething problems. Due to its cooling effect it gives relief in burning sensation in the urinary tract, burning sensation over hands and legs, sleeplessness, irritability. Relieves mental fatigue and optimises concentration and memory. Also recommended in Cough, bronchitis and spermatorrhoea. 62 to 125 mg to be taken in the morning and evening with honey or as directed by the Physician. Milk, Butter, Friut juice etc.